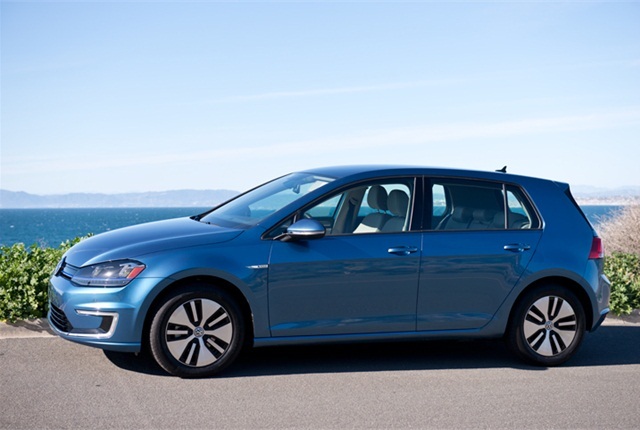 Photo of the Volkeswagen e-Golf by Vince Taroc. The battery-electric BMW i3 has topped Kelly Blue Book's list of the top 10 green cars for 2015 for the second year in a row, KBB.com has announced. The vehicle information and valuation data provider also chose two Toyota vehicles, two Volkswagen cars, and one Ford and Chevrolet car on its "10 Best Green Cars of 2015" list. The list includes four EVs, five gasoline-electric hybrids, and one clean diesel car. Cars that followed the BMW i3 included the Volkswagen e-Golf, Nissan Leaf, Toyota Prius, Honda Accord Hybrid, Tesla Model S, Chevrolet Volt, Toyota Camry Hybrid, Ford C-Max Hybrid, and Volkswagen Jetta TDI. "The list of 'green' vehicle standouts continues to blossom, and with strict Corporate Average Fuel Economy (CAFE) requirements coming down the pipeline, auto manufacturers are making stronger advancements each year in creating more environmentally friendly vehicles," said Jack Nerad, KBB's executive editorial director and executive market analyst. The BMW i3 impressed KBB because it "can sprint to 60 mph in just over 7 seconds, and is made in a factory powered entirely by four wind turbines," Nerad said. "And if 81 miles of electric range doesn't work for you, the i3 can be had with a small gas generator that lets you go as far as there are gas stations."